- Based on the Spaced Repetition learning method, one of the psychologically best established and efficient memorization techniques. 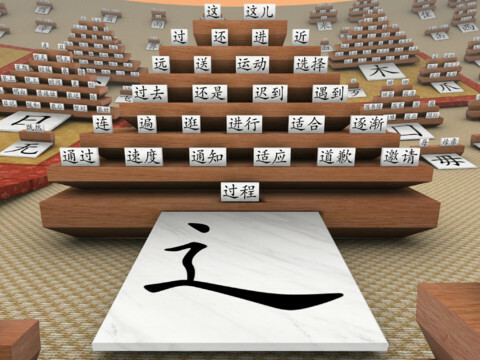 - Learn the meaning and pronunciation of the 1200 words from HSK levels 1 to 4. The HSK is the most widely used test of Chinese as a foreign language. - All words have audio playback, pronounced by native speakers. - On the new iPad, high resolution is fully supported. - Teaches simplified characters, the official writing system in Mainland China. - Teaches Mandarin Chinese pronunciation, the most widely used pronunciation for Chinese. According to the features, it’s nothing new, but what sets it apart is the totally unique visual way of presenting and categorizing Chinese characters. The lack of good visualizations based on Chinese characters is quite surprising. There are so many ways to get creative with characters. This app seems to do that. I would love to just explore characters using this app. Unfortunately, I don’t have an iPad 2/3 to check it out. If you have one, please download this app and tell us how it is!